As I read this, it’s near future SF. Very near. Like three years from now near. The story takes place in 2020 and in Saskatchewan, which is kind of neat. There are a lot of Canadian references dropped that are more than just prairies-related, as well, so that adds to the fun for me. And this book was fun. 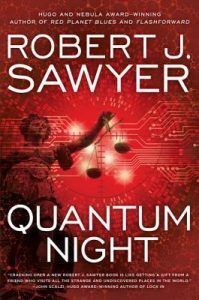 I’ve read many (most) of Mr. Sawyer’s books and I’ve enjoyed all but one so far, and this one falls firmly into the enjoyed category, with a couple of small caveats. The basic principle underlying the book is the tying of quantum mechanics to consciousness. There’s a lot of research that’s gone into the book (Mr. Sawyer has actually put a reading list on his website), but it mostly doesn’t intrude on the story. Yes, the main character is a very competent experimental psychologist. Yes, his love interest is a very competent experimental physicist. Yes, that lets them have some info-dumpy conversations to bring each other up to speed and stitch the critical scientific ideas together. But it mostly doesn’t get in the way. Mostly. Utilitarianism. I get it. Shut up already. The main character is a deep subscriber to the doctrine of Utilitarianism, the idea that actions are right and good if they benefit the majority of those affected in a measurable way. But if there was a flaw in the character it was how he vocally looked at everything from a utilitarian perspective and told other people he was doing it, or offered advice from that perspective, or even in the privacy of his own skull. It’s clearly a deliberate flaw, because otherwise the character is a really great guy, though the story shows him parts of himself he might rather not see. If he’d used the phrase, “The greatest good for the greatest number,” one more time, I would have wanted to smack him. The real world intrudes very well into the story. 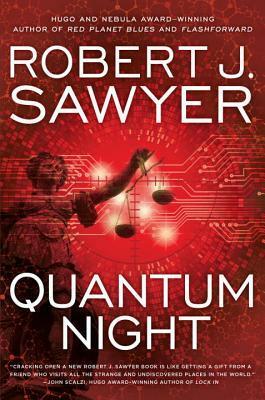 With a story taking place only a few years after publication, that can be a dangerous thing in near future science fiction, but Mr. Sawyer extrapolates current (2016) political and social trends, turns them up to eleven, and ties some things in with the science fiction ideas he’s presenting to give a potentially scary short term future (not quite the same one we’re looking at now, but there are eerie parallels). It will, hopefully, pass into the realm of alternate history in a few years, but that doesn’t make the all-too-human possibilities in the book any less chilling. Overall rating: 4 stars. This book has a good mix of what I like in near-future SF: human characters, realistic events, and potentially plausible science. If it also has a little too much psychopathy, well, that’s part of the story too. Philosopher’s Zombies? The idea is a little frightening, but I’m quite sure I have an interior monologue so I can’t possibly be one. Not so sure about all of the people around me, though.